New ELAN Discovery feature significantly simplifies set-up with the auto-discovery and auto-configuration of compatible devices on the network. AMSTERDAM, NETHERLANDS — Continuing to innovate its award-winning entertainment and control platform, ELAN – from Nortek Security & Control – today introduced the 8.2 software update to enhance the intuitive ELAN UI and reaffirm the brand’s “your world, made simple” value proposition. The introduction was made at ISE 2018 in Amsterdam in the RAI Convention Center in Nortek Security & Control Stand 1-N50. For integrators, installation has never been easier. The new ELAN Discovery™ feature simplifies set-up with the auto-discovery and auto-configuration of compatible devices on the network. Discovery scans the system’s IP networks – including wireless – to find all devices by IP and MAC addresses. Devices with the ELAN beacon can be provisioned and installed with just a click, saving substantial time on every project. ELAN 8.2 also marks the introduction of the new ELAN Views feature, which allows integrators to create a custom floor plan rendering of an installation, and view and control subsystems in 2D or 3D space. Integrators can quickly move from standard sub-system view to 2D or 3D view, and back again. Event Maps can be used to trigger the Views layout, enabling homeowners to immediately see a tripped security sensor displayed in the 2D or 3D model, for example. Additionally, Cloud IR Library source interfaces can now be modified through ELAN 8.2. Integrators can export, import and create copies of IR Library Sources, and a full library is available to be loaded on a PC for offline access. ELAN 8.2 also elevates the personalized smart home experience with the most ultra-intuitive, easy-to-use software to date. 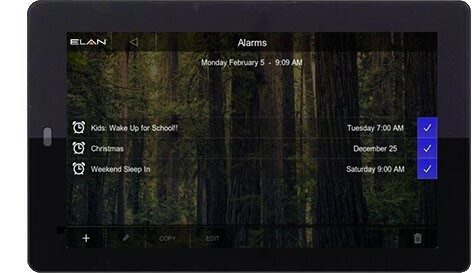 ELAN 8.2’s all new ELAN Touch Panel Alarm feature allows homeowners to set one-time and repeating alarms to ELAN touch panels with the option of a crescendo (soft wake) function that eases them into their day. Custom installers can also trigger Event Maps (multiple events from a single command) from Alarms, further customizing the experience for the homeowner. The 8.2 release also includes a new enhanced security provision that requires a user account password, and a new touch panel disable feature that allows users to clean them more easily. ELAN 8.2 also offers ELAN HR10 Remote support, expanding the homeowner’s system interface options. The ELAN HR10, a single-room control solution, makes it easier than ever to get the ELAN user interface in more areas than before. 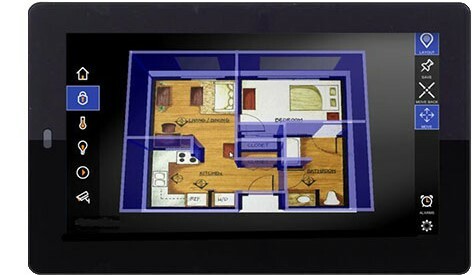 It includes a 2.4” Color LCD screen for easy operation and controls one media zone along with lighting and climate. Other enhanced 8.2 features include an AVR Refresh; updated Device Drivers (offering Autonomic eCast support); ELAN API Updates, which allow the developer to access new media controls introduced in ELAN 8; a Core Installer Update in which backup options are exposed in the installer user interface, and more. For more information, visit Nortek Security & Control Stand 1-N50 at ISE 2018. ELAN®, now part of Nortek Security & Control, develops an award-winning line of whole-house entertainment and control solutions distributed through a comprehensive channel of select dealers throughout the United States, Canada, and countries worldwide. The ELAN 8 update was honored with the “2017 Human Interface Product of the Year” award and continues to expand its intuitive functionality. Nortek Security & Control LLC (NSC) is a global leader in smart connected devices and systems for residential smart home, security, access control, AV distribution and digital health markets. NSC has deployed more than 4 million connected systems and over 20 million security and home control sensors and peripherals. Through its family of brands including 2GIG®, ELAN®, GoControl®, Linear®, Mighty Mule® and Numera®, NSC designs solutions for national telecoms, big box retailers, OEM partners, service providers, security dealers, technology integrators and consumers.